I’ve been slowly replacing our cleaning products with more environmentally friendly ones, choosing non-toxic commercially produced cleaners and homemade things like vinegar and water or a baking soda paste. In the process I’ve discovered that it’s possible to clean just about everything in my house with either Dr. Bronner’s Castille Soap, vinegar and water or baking soda. The one place I persist in using a commerical cleaner (apart from the laundry and dishes) is the toilet bowl. I tried using Dr. Bronner’s for a while, and the toilet seemed to get clean at the time, but it got dirty again really quickly. 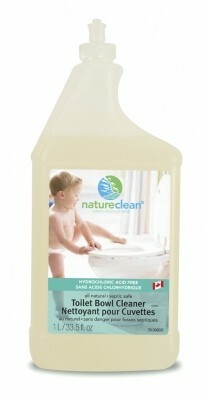 So my toilet bowl cleaner of choice at the moment is made by natureclean, and it works great, doesn’t stink of horrible artificial scents and it’s non-toxic. However, every time I pull it down from the shelf to clean the toilet, my toddler points at it and shouts, “BEBE!” And she’s right, of course. There’s a picture of a baby right there on the bottle. About to climb into the toilet. I understand the marketing at work here. This photo is saying, “Your toilet will be so safe and so clean that you won’t have to worry about your kid climbing into it!” But it also seems to be saying to my toddler, “Here is a really fun product for babies that your mom won’t let you play with!” My toddler has a set of cardboard cards with pictures of babies on them, and board books with pictures of babies at play too. Why would she think that the bottle with a picture of a baby on it is something that only adults may use? And why even suggest to toddlers that the toilet is a fun thing to climb into or play with at all? 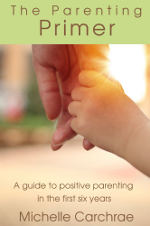 Most toddlers probably give it a try at some point, but I think it’s probably best to avoid suggesting it to them. No matter how non-toxic or environmentally friendly a toilet bowl cleaner is, I don’t want it to be attractive to my toddler. We always keep it well out of reach and I’m pretty sure that even if she did get her hands on it she wouldn’t be poisoned, but still. I’d rather see a picture of an adult cleaning a toilet than a picture of a toddler climbing into one on the packaging. I’d especially love to see a picture of a man cleaning a toilet, actually! Or even just a picture of a meadow of flowers or something equally neutral. What do you think? Do you mind seeing babies on cleaning product labels? Ooh, yes, a picture of a man cleaning the toilet. I like that suggestion! I agree, a picture of a baby on a cleaning product label doesn’t seem like the best idea (and a baby stepping into the toilet even less so!). We use baking soda, vinegar, and tea tree oil for the toilet – perhaps along with a healthy dose of “if I can’t see it, it doesn’t exist”. It looks clean enough though! I sprinkle the baking soda into the bowl and let it sit for a few minutes. Then I spray in my all-purpose cleaner – 50/50 water/vinegar with several drops of TTO. It fizzes a bit but nothing exciting. ;) Then I just scrub and flush. I do the same for the bathtub – sprinkle, spray, scrub. This is what I use “Bowl Me Over”, it works great and there’s no baby picture, although the picture of a man cleaning was a good idea. :) Like with all of my cleaners, I keep them away from my children no matter how safe or green they are.